If you’re a newbie to video editing and there’s one thing you will learn today, make it this: light leaks can make your video POP! Light leaks are one of the easiest effects in video editing platforms to apply to your footage by adding texture, warmth, depth and emotion to your videos. If you want to give light leaks a go but aren’t sure where to start, read on! I’ve created this quick what-and-when guide to help you get the most out of light leaks, and in the process create some really unique and beautiful videos! Light leaks were first used back in the days when film was shot on celluloid, and would occur when a small crack appeared in a cameras light-tight chamber. This would accidently let a tiny bit of light stream in and expose the film, thus creating a “light leak”. This leaked light would diffuse across the film, creating a flare of light across the image. Back then this was considered a mistake, however in recent years many filmmakers have actively sought to include light leaks in their footage, striving to get the unique look they provide. When To Use Light Leaks? Though the possibilities are endless, some of the best examples of include wedding videos, sport videos and music videos. Wedding footage requires warmth, romance and softness to truly capture the emotion of the occasion. By simply adding light leaks and changing the blend/composite mode you can give your footage an alluring and delicate look (such as a golden sunset) and make your video really stand out in the eyes of your client. Unlike wedding videos, sport videos require a more energetic feel to really set the scene. Consider light leaks with brighter colours like reds or oranges, and use rapid transitions and flickers to create liveliness and action. Using Light Leaks In Music Videos. Music videos require a bit more atmosphere in their footage to really make a person feel they are there. Using light leaks can add energy and excitement, particularly when you incorporate lens flares or blue tinged light leaks! 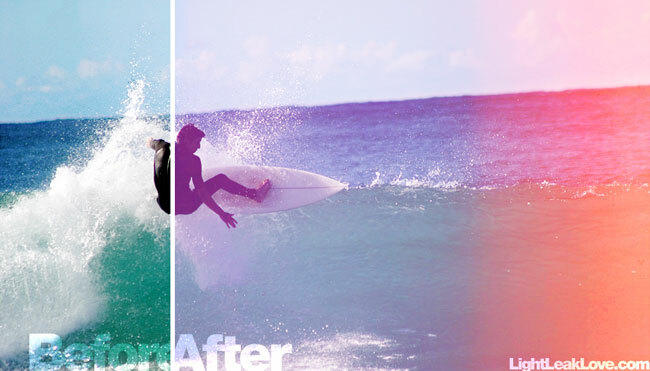 The process of applying light leaks is quite simple and can be done in a matter of minutes. The effects, however, are long lasting! At LightLeakLove.com we have a free sample light leak collection for download, which allows users to experiment with a range of light leaks! You can use them as many times as you want, so you can truly see how much light leaks can add to your video. The free sample light leak collection features light leaks from our three most popular collections, so you can get a taste of what type of light leaks you’d like to use in your next video! If you have any questions regarding the use of these effects, just email us at hello@lightleaklove.com. We’d love to hear from you! Also we’d like to extend a really big thanks to Rebekka for letting us contribute this guest post, and for you, the reader, for giving us your time! Great post! I think I’m gonna give it a try. Great Arjan, I would love to see some of your video magic! I’ve got 20 free light leaks on my site too.